The ultimate Hook Over Feeder, this one is more crack-proof, crush-proof, and freeze-proof than plastic. The molded-in bracket easily hooks over any 2-by-wide board for an instant portable feeder. The bracket features a center notch so the feeder can straddle an upright for added stability. Features internal capacity graduation marks shown in quarts and liters. Rubber is naturally safe and soft for animals. 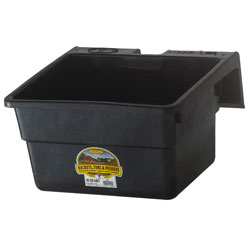 17 inch long by 16 inch wide by 10 inch high, holds 18 quarts (4.5 gallons). This hook over feeder is more crack-proof, crush-proof, and freeze-proof than plastic. Features molded bracket hooks that easily hook over any 2-by board. Internal capacity markings are shown in quarts and liters. Center notch allows for hanging around a vertical fence post up to “ wide. Ideal for field, pasture, trailer, or stall.